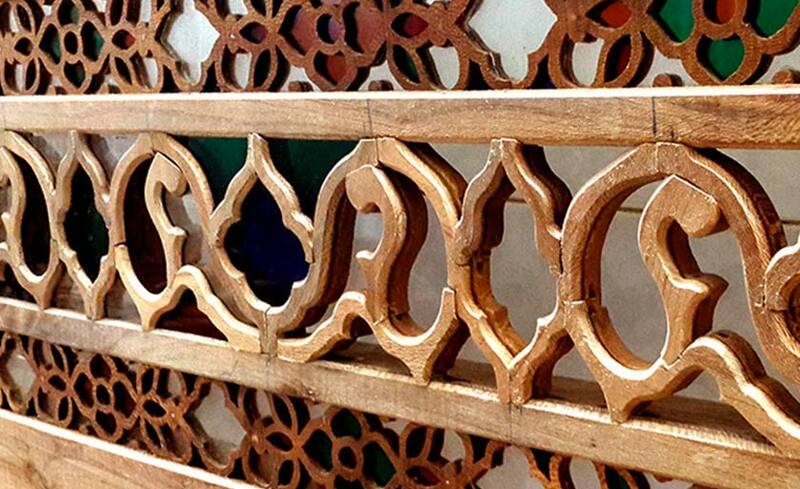 Wood-joint arrangement is a wooden combination based on authentic designs of geometrical motif which is made from joining the same size cut pieces of woods together. 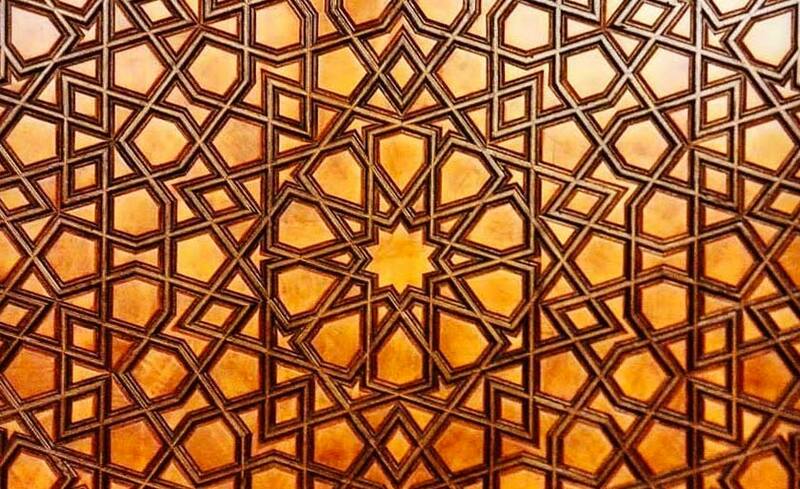 Repetition of a supporting wood in a mirror image or symmetrically causes wood-joint arrangement appears precise, harmonic, elegant and attractive in a larger view, the arrangement and order which has been created by wood pieces based on distinctive latticework. Some researchers believe that using this art was probably initiated in Abbasid dynasty and it became prevalent in Egypt and Syria from the 6th century to the 8th century (AH) and since that time it has developed in Iran. 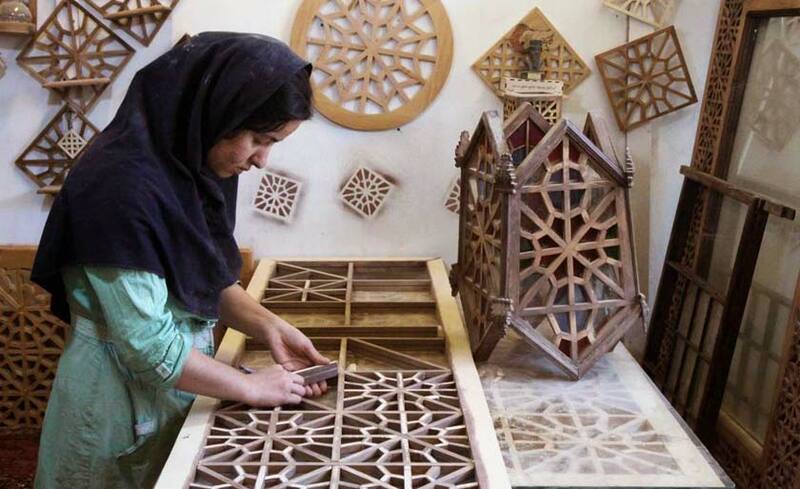 Based on available evidence and works, the history of this art in Iranian architecture goes back to Seljuk and Safavid dynasties and Esfahan has been the origin of this art. 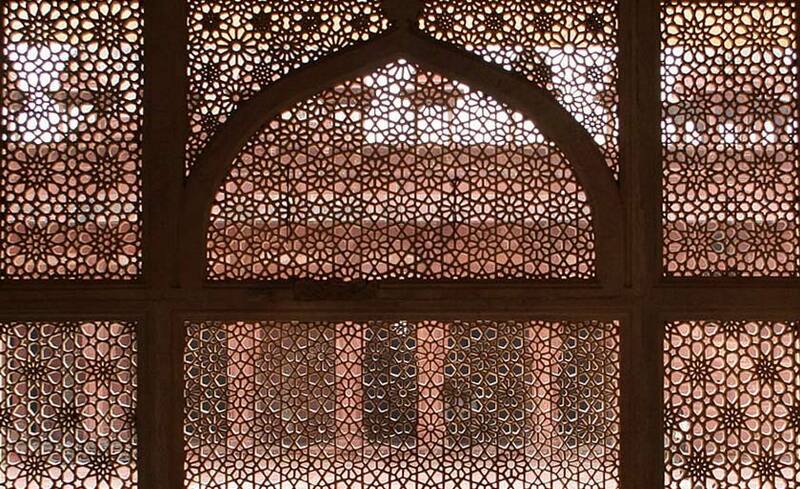 This style has been usually used in construction of doors of sacred places, shrines and pulpits, and lattice has been used in making windows of houses, palaces and fences. Basis of wood-joint arrangement is motif geometry which not only has been created spontaneously but also it has deep scientific background and has been formed based on the principles of mathematics. The regularity and arrangement which is seen in a given piece of wood-joint arrangement is due to a very exact and beautiful linear composition which is presented in the form of flat and cut wood joint. In wood-joint arrangement the joints are carried out in three ways: 1- bell and spigot joint 2- side by side joint 3- half-half joint. These names traditionally refer to the methods of connecting flat and cut wood pieces. 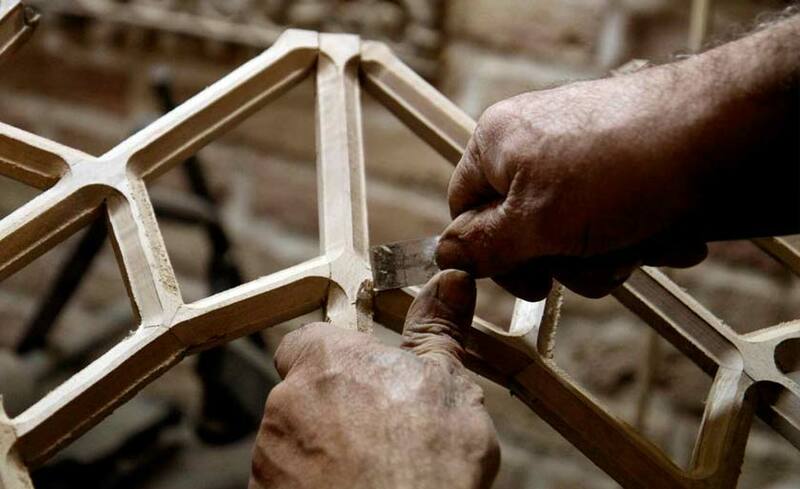 In order to create design by the knots, woods are cut with the thickness of drawn joint and at the same time supporting woods (the pieces which are used repeatedly in the work) are made from prepared frames. Then the angles of joints on the wood are cut by buttressed saw and the surface of the pieces is engraved by a plane and two heads of each piece are connected by bell and spigot or any other joint. Different types of forest wood can be used in wood-joint arrangement, but due to its long lumbers and its flat texture buttonwood is more applicable. Prepared pieces must be made from completely dry wood so that there shall be no change in their dimensions after being worked because any change or warp made in wood pieces disrupts the arrangement of the whole work and bell and spigot may disjoint. 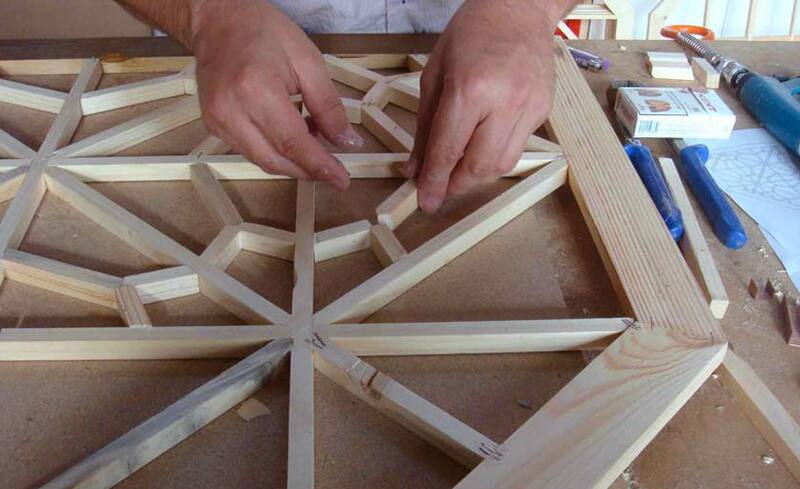 Common paste which is used in wood-joint arrangement is natural glue which becomes firm and hard when it gets cold. Also, it does not damp the wood and does not leave any trace on the work. 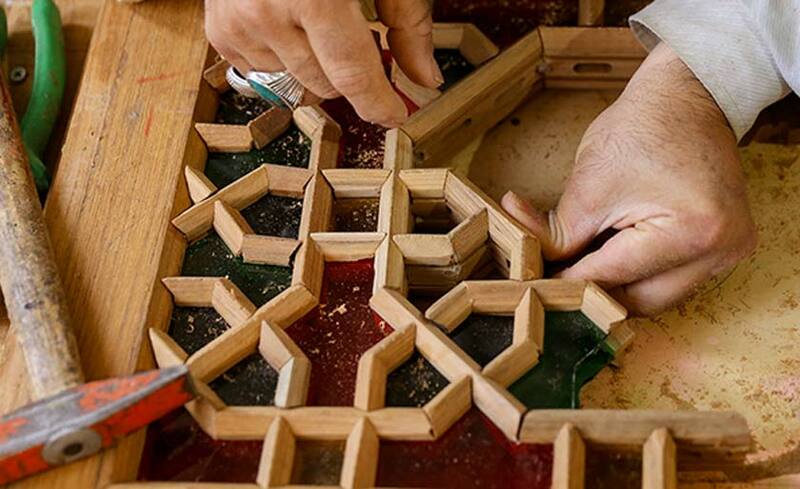 Wood-joint arrangement is also used with colored glass or other wooden artifacts like wood carving and inlaid working. It has higher artistic value if it is made based on more delicate and complicate designs.